Sandstorm's Blog (Home of ssUltimate Library): Tick/Untick a checkbox on Grid with AllowCellSelection = .F. 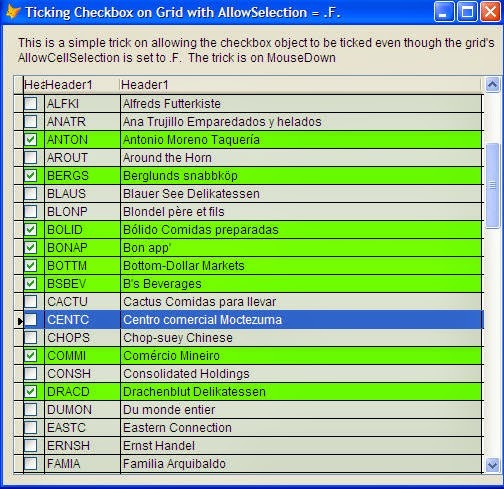 Tick/Untick a checkbox on Grid with AllowCellSelection = .F. While any of the two will work, I will be showing here an alternative to that where the Grid's AllowCellSelection will still be set to .F. disallowing individual objects inside to receive a focus yet will allow you to click on the checkbox as if the checkbox can really be selected. Said trick will give the grid an illusion that there are two groups, i.e., 1st is the checkbox and the 2nd is the rest of the columns. And for those new with Grid Dynamic Properties as well, just to highlight the selected (ticked) records, I use DynamicBackColor here. Hope you'll find this useful! Cheers!